Following the collection earlier on in the year it was great to see Cyrilyn again! 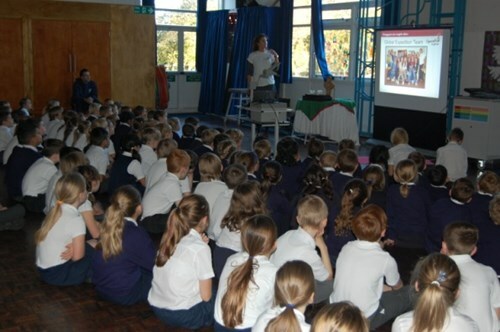 We really enjoyed the presentation that Operation Orphan showed us. We were glad to see that everyone loved our gifts of coats and fleeces. It really made us realise how much our simple unwanted coats really changed their lives in different countries. The amount of warm winter clothing they received really put a smile on their faces and when we saw there smiles on their faces it really put a smile on our faces. Higham St John’s School gave a lot of coats for the orphan children who need to keep warm. Seeing the videos of the full bags of winter clothing people gave to the orphans was amazing to see how many there were. Everyone at Higham hopes that they can been involved in next year’s appeal to raise much more coats. We are very proud to be involved in such a great cause for children who need our help, and Higham school love to be a part of it. We hope that all the children who received our coats loved them and we hope you have a warm winter in your new coats!